A summary of the history of the complex Bell Punch company and its calculators. At the end of 1961 the Bell Punch Company put the Anita Mk VII on the market in continental Europe and the Anita Mk 8 in the rest of the world as the world's first electronic desktop calculators. These were the only commercial electronic desktop calculators for more than 2 years. The original Bell Punch Co., Limited, was established in London in 1878 to acquire the patent rights of an American hand registering ticket punch which had already been adopted by a few tramway companies in Britain. The company was very successful in producing the ticket punches and supplying printed card tickets, and in order to expand moved in 1919 to a larger site in Uxbridge, just to the west of London. It was soon expanding into other product areas too, such as ticket issuing machines primarily for use in cinema box offices, and taximeters. In July, 1927, Control Systems, Limited, was incorporated, for the purpose of acquiring and consolidating the direction of the growing diverse activities of the Bell Punch Co., Limited. As designed, this company was purely a holding company. As an adjunct to one of its ticket control systems the company required a small adding mechanism, and in the search for a tried mechanism instead of devising one of its own from scratch, it became acquainted with a small adding machine that was being developed by Petters, Limited, of Yeovil. It was not a difficult matter to acquire the rights in this mechanism from Petters and thus it was that the company embarked upon the manufacture of a small adding machine to which it gave the name Plus. This adding machine was developed to a full keyboard calculating machine which was introduced launched upon the market under the name Sumlock in 1940. For the purpose of more efficient exploitation of the Plus and Sumlock machines London Computator, Limited , was incorporated to deal with the sales side of these activities. In December 1957 Lamson Industries acquired a controlling interest in Control Systems from the widow of the proprietor, John Black. It allowed Bell Punch to operate independently under its own management in Uxbridge. In 1960 Control Systems acquired the English operation of Comptometer Corporation of Chicago, U.S.A., including the trademark and the right to the "Comptometer" name in England. Comptometer Corporation lost that entire market and then signed a contract with Control Systems to have all their Comptometers manufactured in England and shipped back to the U.S.A.. The English Comptometer company was fully integrated into Control Systems on 1st. January 1961 under the name Sumlock Comptometer Ltd. Under the Plus and Sumlock names, Bell Punch developed and marketed a wide range of mechanical key-activated adding machines, similar to the Comptometer. 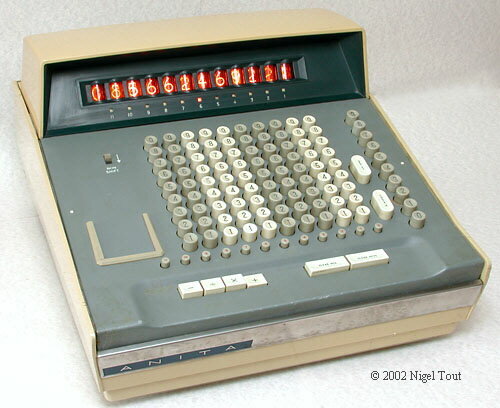 ANITA (variously "A New Inspiration To Accounting" OR "A New Inspiration To Arithmetic") was the name given to the world's first electronic desktop calculators which were developed by the Bell Punch Company. By the mid-1950s the company held a dominant position in Britain and many of its ex-colonies as the manufacturer of calculators for commercial use. It felt its position threatened by the newly invented electronic computer where machines such as LEO (Lyons Electronic Office) were beginning to make inroads into accounting. In 1956 Norbert Kitz (a.k.a Norman Kitz) was brought in to explore the possibility of applying electronics to its products. Norbert had worked on the pilot "ACE" (Automatic Computing Engine) project at the British National Physical Laboratory, at Teddington, Middlesex, in the late 1940s. The logic circuits of this machine used 800 thermionic valves (vacuum tubes). Since the company was geared up to produce the hundreds of thousands of small precision parts for mechanical calculators, he initially explored ideas for a machine using a hybrid of mechanics and electronics. However, there were problems with mechanical, rotating, pulse generators, and development soon resulted in an electronic machine with the only moving parts being the keys on the keyboard. The logic circuits of the final machine used cold cathode switching tubes rather than transistors, which were still new, electrically vulnerable, and expensive devices. A counting tube called a Dekatron was also used to simplify the design of the keyboard decoding circuit, and the display used 12 numerical indicator tubes similar to the "Nixie" type. The machine had a full-keyboard, similar to the company's mechanical calculators. The first model, the Anita Mk 7 (see photograph above), was ready for sale in late 1960 but multiplication was slighlty complicated. However, it did not find favour with the company's sales force who were afraid that the new operator skills required would cause confusion among the army of mechanical Sumlock operators in the field. 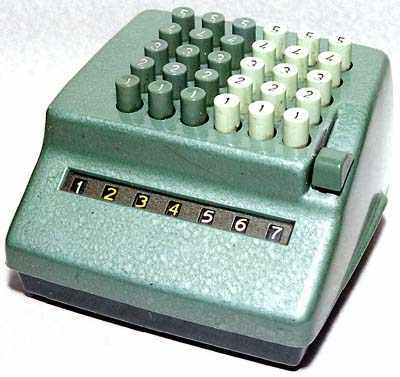 Fortunately, the export division welcomed it into their market for decimal calculators and it was launched at a business equipment fair in Hamburg in October 1961. Many hundreds were exported to continental Europe, mainly Germany, the Netherlands, and Belgium. Development continued to produce a machine to a home market specification, and also in October 1961 the Anita Mk 8 (see photograph above) was launched at the Business Efficiency Exhibition in London. This was also very successful and many thousands were produced at the company's Portsmouth factory. For over two years there was no other electronic desktop calculator. From then on there was period of steady development of additional features. Chain arithmetic appeared in the Mk 9 and a Sterling currency display in the Mk 10. Machines which did not go into production included one with the square root function and another with memory. During the 1960s silicon transistors and diodes became available at prices affordable for use in calculators. A hybrid design was produced which used rings of transistors in the logic instead of cold-cathode trigger tubes and selenium diodes, but retained the Dekatron counter tube. It could be a quarter the size of the Mk 8, too small to have a full keyboard, and so the first transistorised model, the Mk 12 , was introduced in 1966 with the now standard 10-key keyboard. The last of the series was the the Mk 11 of 1968, which was a low-cost version of the Mk12. Semiconductor development continued, fuelled by the Cold War defence needs, and integrated circuits became available. The company chose MOS (Metal Oxide Semiconductor) integration as the most promising for its needs because its low power consumption allowed the manufacture of very large chips, and there was no requirement for very high speed. The company worked closely with Marconi-Elliott in Glenrothes, Scotland in the design of integrated circuits for its calculators, which were first used in the Anita 1000 series which went on the market in 1969. Following further development, LSI (Large Scale Integration) integrated circuits allowed a much reduced number of components and a set of 4 chips with few other components was used in the Anita 1000 LSI series in 1971. Anita 1000 LSI desk calculator. In practice, the three names Bell Punch Company, Sumlock-Anita, and Sumlock-Comptometer all refer to divisions of the same company, Control Systems Ltd., which itself was part of Lamson Industries. "Lamson Industries Limited employs some 15,000 people of whom about 10,000 work in the United Kingdom. Of these, approximately 400 are employed in the Bell Punch Machine Parts Division at Uxbridge and Herne Bay, making parts for the company's machines. A further 450 work in the Ticket Machine Division at Uxbridge—some on machine assembly, some in the print shop where the tickets are produced, some on the design and development of new machines, and others in the sales, shipping, purchasing, work study and other ancillary departments. Also at Uxbridge are 400 personnel of Control Systems Ltd., which provides central management services to Bell Punch and other companies in the group, and nearly 100 people engaged on research and development for another Lamson Industries company, Sumlock Anita Electronics Ltd. The latter was formed quite recently to take over the Bell Punch Co.'s former activities in the field of calculating machines, another sphere in which they have been pioneers, having launched—in 1961—the world's first electronic calculator. To complete the count, as far as Bell Punch and Sumlock are concerned, there are 550 employed in the Sumlock factory at Portsmouth, mainly on the production of calculating machines, and a sales and service staff of 1,000 working for Sumlock Comptometer—which is responsible for the marketing of these—and Automaticket. Bell Punch and Sumlock therefore account for around 3,000—or just under a third—of the U.K. personnel of [the] group." According to the journal "New Scientist" in 1972: "Sumlock Comptometer was easily the largest UK supplier [of non-programmable calculators] in 1971, with sales estimated at about £4.5 million [about US$10.75 million]." The LSI series of machines was enthusiastically received by the market and was very successful. After years of being asked to make the machines smaller and lighter, the main criticism was that they were so small and light that they could be easily knocked off the desk ! The journal "New Scientist" reported in 1972: "Considering non-programmable calculators, Sumlock Comptometer was easily the largest UK supplier in 1971." However, the company was devastated when GEC (the British Company) which owned Marconi-Elliott, pulled out of semiconductors and put their Glenrothes plant up for sale. Norman Kitz tried to persuade Lamson Industries to buy it, but it was sold to General Instrument (GI) of America. They continued to supply Sumlock-Anita with chips but the engineering design links were broken. In 1972 Rockwell, the American defence company, approached Sumlock-Anita with an offer to put the calculator circuitry on to one chip. Previously the chips had always been bought from British suppliers because of the need to keep close technical back-up of these suppliers in a high-tech industry. It was a change of policy which was to prove fatal. Development was started and the prototype of a pocket calculator was produced using the Rockwell chip. However, the management could not see a market for it, and it was sidelined. Some months later when Clive Sinclair brought out his Executive calculator there was panic by the management and the pocket calculator was rushed into production. Although the resulting 800 series of pocket calculators was still very successful, Sinclair became the market leader in the UK, and got the credit and the knighthood. After years of successful innovation, maintaining the company's market leadership it was a big disappointment. The first Anita hand-held calculator, the 811. In the early 1970s, Rockwell was hungry for commercial diversity. In 1973, as the selling price of calculators and the profit margin plummeted, Lamson Industries sold Sumlock Anita Electronics, the calculator manufacturing company, and Sumlock Comptometer, the sales and service company, to Rockwell. 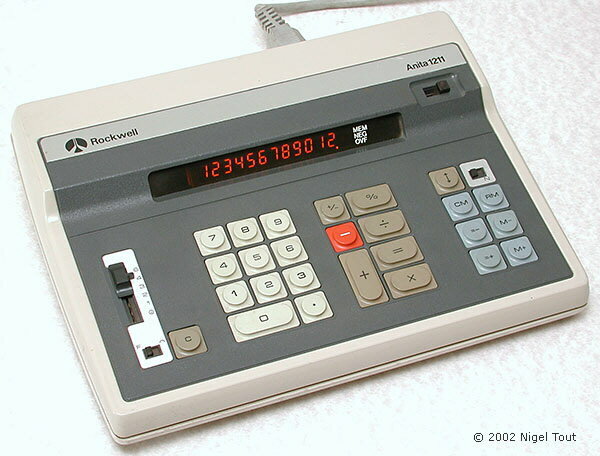 Rockwell and Anita models were manufactured at the Portsmouth factory, including the Rockwell-Anita SL (Slim Line) series of desk calculators. In 1975 Rockwell got the contract for the Space Shuttle and lost interest in foreign commercial spin offs. It sold all the assets to various buyers. The name Sumlock Anita was sold to a trading company which sold off the existing stock and then badged various imported products until the name finally lost its selling power. Control Systems Ltd. (the original parent company) with the remainder of the Bell Punch Company which had not been sold to Rockwell, continued with the traditional products—ticket printing, ticket issuing machines, coin machines, totalisators, and taximeters—though with a declining market, until it was broken up in 1986. This Slim-Line desktop model is inspection stamped March 1976, and may be one of the last Anita calculators. 1878 - Bell Punch Co., Limited, was established in London. July 1927 - Control Systems, Limited, was incorporated, as a holding company for the purpose of acquiring and consolidating the direction of the growing diverse activities of the Bell Punch Co. Early 1940s - London Computator, Limited, was incorporated to deal with the sales and distribution of the mechanical calculators manufactured by Bell Punch Co.
December 1957 - Lamson Industries acquired a controlling interest in Control Systems . 1961 - Sumlock Comptometer Ltd formed from the amalgamation of the British operation of Comptometer Corporation of Chicago, U.S.A., with the calculator operation of Bell Punch Co..
1961 - The Anita Mk VII and the Anita Mk 8 were launched as the world's first electronic desktop calculators. 1966 - Sumlock Anita Electronics Ltd. was formed to take over the Bell Punch Co.'s former activities in the field of calculating machines. These were still distributed in Britain by Sumlock Comptometer Ltd.
1973 - Rockwell International of the U.S.A. buys Sumlock Anita Electronics from Lamson Industries. The Bell Punch Co. continues manufacturing and selling its other products, such as taximeters. About 1976 - The Sumlock Anita name was sold to a trading company and eventually disappears. About 1986 - The Bell Punch Co. was broken up. © Text & photographs copyright Nigel Tout 2000, 2001, 2002, and otherwise as indicated.